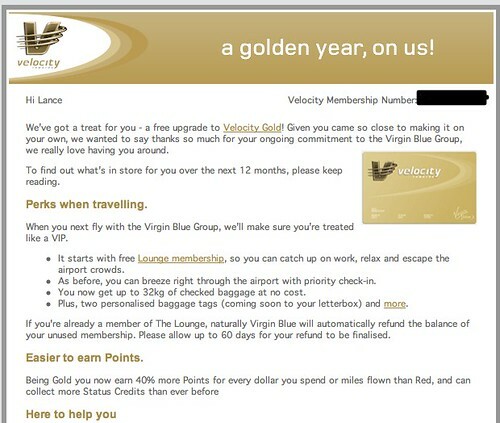 Excellent news from Virgin Blue in my email inbox just now. It was a bit of a surprise, as I have not flown with them for a while, and I thought that my status would be expiring if anything. and yes – turns out that was a bit of a mistake. A big mistake. I wonder how many people were affected. The emails were 2h:40m apart, so a relatively quick save. snap! same email(s) for me. 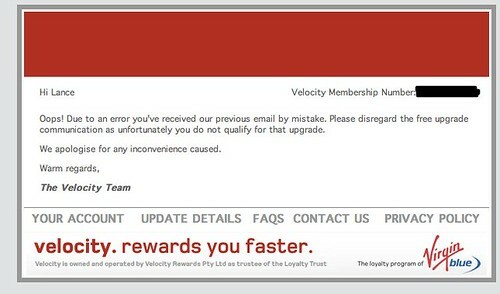 For some strange reason, I got the apology, but never got the “welcome to gold” email. I’m pretty confident that my one flight with them in my 447 month lifetime doesn’t count for much. If Twitter is anything to go by (a search yesterday returned a lot of results) it seems likely they sent the email to pretty much everyone in their database. Big fail. No wonder there were tears!